We understand the important role that support from family, loved ones, and friends plays in the recovery process. At Middlesex Hospital visitors are encouraged to visit patients between the hours of 10 a.m. - 8 p.m., and are limited to two (2) at a time. As our first objective is to ensure the best possible care for our patients, decisions concerning visitors will be jointly made by the patient’s caregiver and by the patient. We encourage families and friends to respect the new mother’s need for rest and privacy by keeping visitations brief. Visitation is based on "mom's choice" and is encouraged between the hours of 8 a.m. - 8 p.m. There are also special situations for the CCU/IMCU and the Psychiatric Unit. Please call ahead or speak to your caregiver for the visitation policy on these units. Middlesex Hospital is located at: 28 Crescent Street, Middletown, CT, 06457 Copy address to paste into Text, Email, App of choice. Exiting the Outpatient Center turn right onto Saybrook Road. Follow approximately 1.5 miles. After two traffic lights, Saybrook Road turns into Main Street Extension. Turn left onto the Route 17, South Main Street connector. At the light, turn right onto South Main Street. Follow to Crescent Street. Turn right onto Crescent Street. The entrance to the hospital and the Emergency Department are on Crescent Street. Exiting the Center turn left onto Jones Hollow Road, then turn left onto North Main Street. At the stop light, turn right onto Route 66. Follow Route 66 through East Hampton and Cobalt into Portland. Continue on Route 66 until you come to a traffic light where you cannot go straight anymore. Take left over the Portland Arrigoni Bridge. After the bridge go straight onto Main Street. Follow to the intersection with Pleasant Street. Turn right onto Pleasant Street, then bear left at the next light onto South Main Street. Turn left onto Crescent Street. The entrance to the hospital and the Emergency Department are on Crescent Street. Exiting the Center turn left onto Route 153. Go straight through two lights. Take left onto Route 9 North. Follow Route 9 North to Exit 12. Off exit turn left at the stop sign. Follow to the intersection with Saybrook Road. Turn right onto Saybrook Road. Follow for about 1/2 mile, turning left onto the Route 17, South Main Street connector. At the light, turn right onto South Main Street. Follow to Crescent Street. Turn right onto Crescent Street. 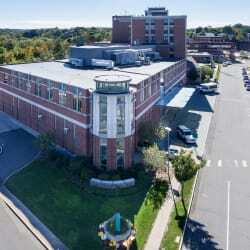 The entrance to the hospital and the Emergency Department are on Crescent Street.